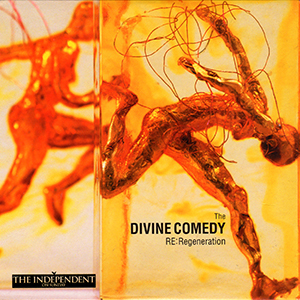 This Regeneration sampler, entitled RE:Regeneration (who and how they came up with the name was never really explained) was given away with various newspaper in the UK the day ahead the release of the album. Not only the Independent on Sunday (which has its logo on the cover), but the Belfast Telegraph Sunday Life as well. 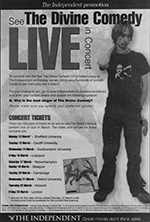 The Independent also featured a competition to win a ticket for one of the shows from the March 2001 UK tour. The front cover features a slightly different perspective of the Regeneration artwork by Claire Burbridge. Different cuts of the front cover exist (on the front pictures, look at the margin after the head on the right edge), with more or less of the picture on the left or the right. 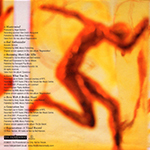 The back cover features the tracklisting and credits; Parlophone and an Independent on Sunday logos; serial number and legal statement; and Internet addresses. On the disc a QuickTime logo is also featured for the video which is included on the CD-ROM track. Near the centre of the disc, we can read: INDEPENDENT 5 01 DISCTRONICS with IFPI L501 under. The rest of the songs, are mostly exclusive to this release, and are more or less interesting. ‘Bad Ambassador’ was often played in acoustic form at that time for various radio shows… However, this version was not recorded for the radio, but comes from an album launch party at the Hotel Billesley Manor in Stratford-upon-Avon. Little is known about this event though. The B-side ‘Born With A Broken Hear’ is exclusive to this release, and one of the most appreciated songs of that era by the fans… It was even the tracks that lead several people to discover and become fan of the band. There are also 2 live tracks from a Dublin show… That particular show was recorded by 2FM and broadcast several times on the radio… But only these 2 songs from the set were officially released. The performance did not get quite an honour to the band, since Neil had the flu and is not at his best for singing. Finally, there is a CD-ROM content which includes the making of Regeneration plus the music video of ‘Love What You Do’ (not listed). The movie, directed by Bryan Mills in included here in a shortened edit… The complete version being exclusive to the (rare) screen plays. While those extras quite highly distributed in the UK, they remain much a collectible in the rest of the world. However, in France another sampler was issued, with two of these tracks and another exclusive one. Later in the year, they’d release in France a limited edition of the album featuring the same edit of the video.